With the advent of the Juncker European Commission, Digital Europe ranks ever higher on the political agenda. There is a risk however that the new Commission continues in the ineffective path of the previous one by promoting the emergence of “pan-continental telecoms networks”. 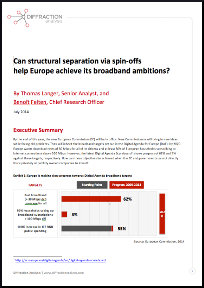 In this report we examine an alternative route to a Digital Europe. We look at structural separation from a capital markets perspective and come to very interesting conclusions for policymakers, activist shareholders and supervisory board members of European incumbents. Our analysis of three case studies suggests that structural separation via spin-offs should be on the political and more importantly on the corporate agenda as it may be better suited to align various stakeholder interests – if it is done properly.